A movie management system should be simple, elegant and flexible. DVDLobby 4 hits the mark by supporting a touch screen and remote control version out-of-the-box. In addition, you can mix and match movies stored in multiple 400 disc mega-changers or your hard drive. DVDLobby 4 makes finding movies a breeze and fun for the whole family. When watching movies wtih the whole family, let each member add a movie to the Screening Queue by browsing the entire collection, then narrow your selection from those movies in the Queue. If you know the movie you are looking for, just drag the alpha-slider. Want to find all movies with Tom Hanks in it? No problem. Search or filter movies by actor, director and over twenty other categories. And you'll always remember your favorites when you can give each movie your own personal star rating. Not sure what to watch but you know what your in the mood for? DVDLobby 4 now supports Themes and Keyword searches. For example, maybe your interested in a bank robbery or a cinderella story. Or perhaps something about dysfunctional families are more up your alley. In either case, you can go beyond just broad categories like genre to narrow movie picks. New in DVDLobby 4 is the introduction of Cinemar's new Content Manager. This is a standalone application that improves the efficiency of managing large media collections. It enables users to add, edit, import and delete movies from any networked PC. These tasks can be tedious from smaller form factor devices, remote controls and touch screens with only on-screen keyboards. The Content Manager also handles importing older DVDLobby databases as well as from MyMovies, DVDProfiler and Movie Colletorz. Perform DVD or Blu-Ray movie look-ups from the Content Manager. With select archiving programs such as AnyDVDHD and DVDFab, you'll also enjoy one-click archiving. We've also thought of our integrators. The Content Manager requires a password to enter ADMIN mode for more critical settings and prevent unwanted changes to the system. With DVDLobby 4 batch loading of movies is supported including auto load of the 400 disk changer Sony BDP-7000ES, and auto load of hard drive based movies in folders. Auto load can save many hours of labor moving to a professional movie management system. Just make system configuration choices, and click the AutoCatalog button. Come back when it's done. Integration with the CX7000ES requires the appropriate device driver. With unprecedented support for hard-drive and MegaChanger based systems (or a combination of the two), family and friends simply click on the movie poster to start the movie in the proper location. It's so easy, even your children will be able to watch their favorite movies without ever touching the physical media. New is the default configuration that supports multiple software DVD players using either ArcSoft TMT, VLC or PowerDVD. You're family doesn't need to know anything about the type of movie file as DVDLobby 4 handles which player to launch for which movie type for the best experience. From a DVDLobby 4 user interface, you can choose to playback a harddrive sourced movie on one or more PCs in multiple rooms of the house as part of the standard configuration. Of course, the PC can also be fed into a matrix switcher for even more zone flexibility when controlled by MLServer 4's optional matrix switcher drivers. 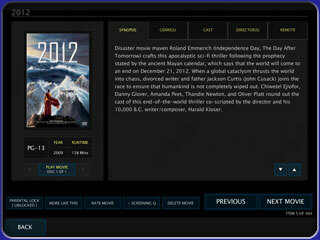 DVDLobby 4 comes with multiple user interfaces for you to use directly, or to customize exactly to your liking. Standard is a user interface designed for use with a "TV Remote Control" on a "10 foot screen" as well as our touch screen version. Also available are optional "Designer Libraries". These user interfaces were created by a professional interior designer for complimenting various decors. New: Filter movies by amount of time you have available: Less than an hour, About an hour, Between 1 and 2 hours, etc. Genre View (Sorts your movies into genre categories) and define custom Genre's to build favorite lists for everyone in the family. Ability to "lock" movies from viewing. Users will not be able to see these movies in any way unless they enter the correct security code at connection.